Exploiting Google Wave: Can the process of journalism be a news organization’s product? My first teaching job was at a community college in the City University of New York system. I taught in the English department, which mean that in addition to my journalism courses, I would fill out my schedule with composition classes. The college had (and still has) some first-rate composition experts, and one of their mantras in training us to teach our students was that “writing is a process, not a product.” The problem for us, of course, is that we had to grade the product, the actual printed papers that students would hand in to us. We did our best to approximate interventions into the process: outlines, drafts, notecards. But apart from standing over our students in a computer lab as they typed, we couldn’t really see the essays taking shape. We made do, and most students were eventually able to grok with us and get what we were talking about when they were at home, typing by themselves, going through the writing process all alone. There’s a parallel with journalism here. Any working journalist realizes that journalism happens over time. Most stories aren’t finished when it’s time to publish them: there was just a deadline that had to be met. Get it to the editor so she can get it to the copydesk so that he can get it to the printer so that they can get it to the newsstands. The story continued. Sources called back after deadline. The shooting victim died overnight. Time marched on and new endings were added to the narratives. Readers were left to try to do the grokking—and the average reader probably knows little about the process of news-making. Enter Google Wave. Like many people, I didn’t really know what to use Wave for when I got my invitation a couple months ago, but I was very excited to play around with it. Like many of those many people too, I have mostly abandoned Wave for my personal use, but I think I’ve found one potential use for it in the world of news. When you log into Wave, you’re presented with a series of boxes that looks like a cross between web-based email, a chat program, and a basic word processor. Invited users are allowed to view and/or change the wave. 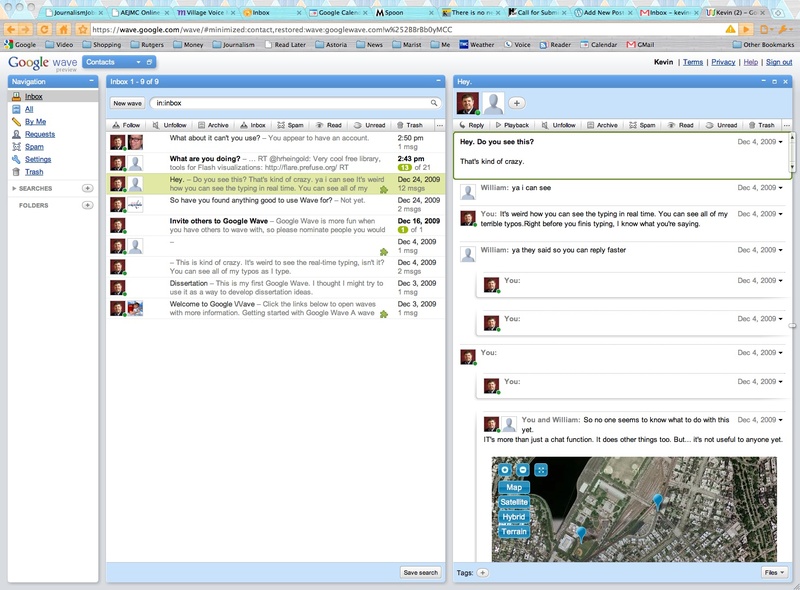 Some news organizations have employed Wave as a sort of multimedia chat room, allowing users to control the wave, moderated by an editor, adding links and files to the discussion. Definitely interesting, but I’m interested in bring Wave directly into the reporting/editing process. Imagine a news organization that uses Google Wave as its content management system. Each editor and reporter has an account, and each story or topic has its own wave. Reporters can begin a wave by collecting their notes in one, and then beginning to organize those notes. Or editors could begin a wave by posing a question or making an assignment and then inviting a reporter or reporters to join that wave and to begin researching. As the wave develops, more reporting is added to it, and the story begins to morph from being a collection of notes into being something more polished, more akin to the story that journalists and readers are already familiar with. But Wave allows reporters, editors, and readers to enter that process at any point and to attempt to follow the process itself. The process becomes the product at the moment an editor makes the decision to open that wave to the public. And Wave’s playback feature allows readers to watch the whole story develop, as it developed, sort of like watching a full day of a 24-hour cable news network on DVR after the day has ended. There are some interesting decisions that need to be made when the wave is opened to more than just the reporters and editors. Will the be let in just as observers of the process, or will it become a crowdsourcing platform that allows the readers to interject into the process? Perhaps that decision will be different for each story/topic/wave. Perhaps some of the stories will be open mostly to reporters and editors, but that has an open section in which readers can comment and contribute. Or perhaps, Wave could be used in a way similar to ExplainThis.org, in which readers pose the questions. In a Google Wave CMS, readers could actually begin the waves, and editors and reporters could choose to open up a particular wave for more reporting. It could be a way to strengthen the relationship between working journalists and audience-reporters in a real pro-am hybrid. It’s still a big mess right now, and my (unsubstantiated) suspicion is that Google Wave is still mostly unused, but the potential is there, the potential to turn the process itself into the product that news organizations create. ← The practice of journalism and journalism practices: Can news and the news business be separated?